Rod Simmons explains what’s on the Wild Side. Standing in a cul-de-sac of the development, where every lawn was manicured to within an inch of its struggling life, it was impossible not to think of the song. 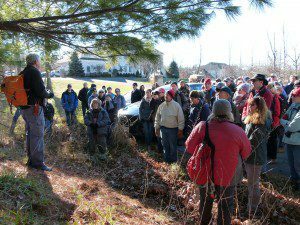 The crowd gathered for the Annual Solstice Walk on December 20 listened carefully to an explanation of what they were about to see ‘on the other side,’ where the Travilah Serpentine Barrens lay in wait. And once past the curtain of trees, the contrast between the two worlds was both stark and wonderful. The Barrens revealed itself to be just as orderly, but ordered by a different set of rules. The question – framed by prejudices and preferences – of which was more beautiful, will have to be answered by the reader. Serpentinite boulder outcrop in the stunted old growth forest. “This area is special,” said walk leader, Rod Simmons, “it’s not just a nice forest.” He expanded on that theme by remarking that there are some who arrive, see the smallish trees and the openness, and conclude that this is a young forest. But in fact it is an old growth forest, the trees are stunted by lack of nutrients; the openness is the natural look of a healthy forest. We don’t always understand what we see, which is one of the reasons the Societies sponsor walks like this one. “All parts of our landscape need to be preserved,” Rod noted. This notion heartily seconded by all. 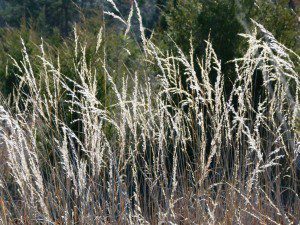 The group struck gold early on, encountering golden Indiangrass, (Sorghastrum nutans), in thick stands under the power line. Unfortunately, also under the power line, starting from dump hills where outside fill had been brought in, invasive non-native grasses and weeds were on the march. Without control, these will become dominant. Short leaf pine, (Pinus echinata), and Virginia pine, (Pinus virginica), were the two most prolific evergreens. 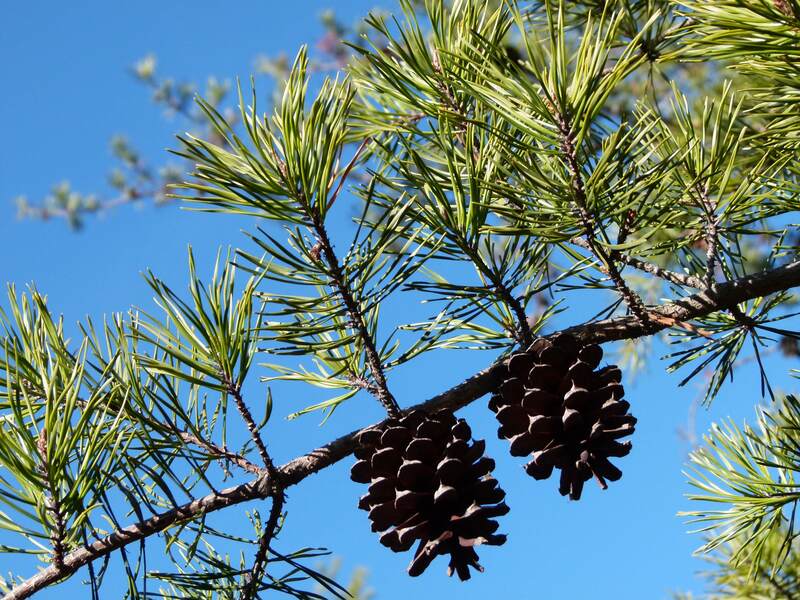 Short leaf pine can live for hundreds of years, Rod explained, and recovers well from fires; his preference would be to promote planting more of the shortleaf in place of white pine. Leaves of shortleaf are longer than those of Virginia pine, twisted, slender and flexible; the fascicles hold leaves in twos or threes. Cones of the shortleaf are somewhat ovoid and nearly sessile. Shortleaf pine, (Pinus echinata), cones ovoid and nearly sessile. Oaks and hickories are the other two most prevalent trees at the Barrens. 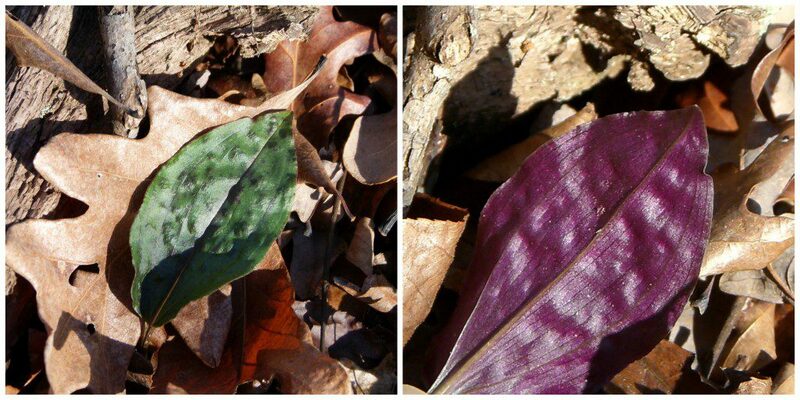 Blackjack oaks, (Quercus marilandica), which like the acidic soil, were lining the edges of the forest, seeking as much sunlight as possible. 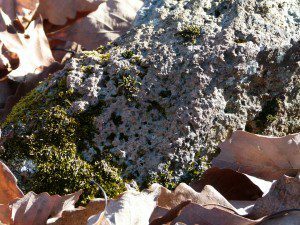 Serpentinite, a kind of soapstone, made a good foothold for mosses and lichens. Serpentinite boulder outcroppings were also in evidence throughout the walk. Serpentinite is ultramafic rock derived from magnesium-rich silicate, and is a type of soapstone. On one stop, a small rock was broken open so participants could feel the silky talc composition which gives it the name. Cranefly orchid, (Tipularia discolor), underside purple. Flower stalk arises after leaf dies back. 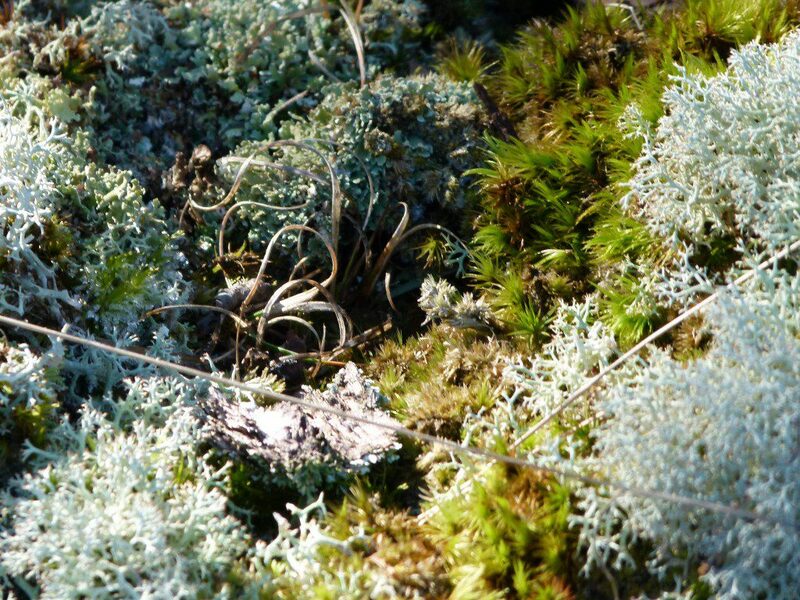 A variety of mosses, and lichens surrounding a curly poverty oatgrass plant, (Danthonia spicata). “Don’t step on the lichen!” You have to love a group who walks on the wild side but doesn’t step on the lichen. The richness of the day was enhanced not only by new learning and appreciation but also by the opportunity to talk with old friends, to make new ones, and to toast together the Spirit of the Green Man. The diverse and unique complexity of the natural community at the Travilah Barrens is a treasure deserving of preservation. As pressures mount for multi-use sports that would transform this spot into just another open area of trails, the importance of a wider appreciation of what is there becomes apparent. Thanks go to the sponsoring organizations, The Potowmack Chapter of the Virginia Native Plant Society, the Maryland Native Plant Society, and the Botanical Society of Washington for their ongoing efforts in this endeavor each year on the Solstice Walk, and throughout the year on many fronts. Great photos and write-up, Sue! This adds well to the information gathered thus far on the site. It was our largest-attended Solstice Walk to date (104 participants; 7.3 bottle toast!). A number of folks have since returned to visit. 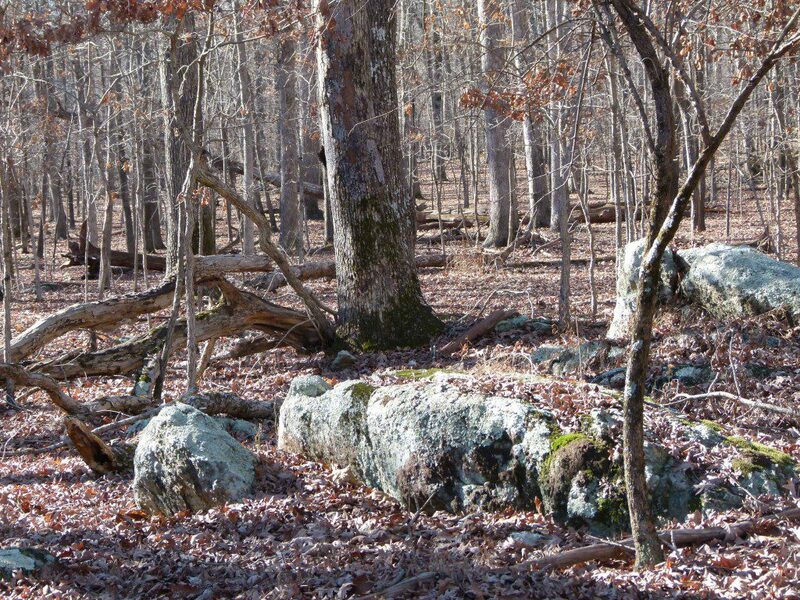 A nice contrast with the more open type of serpentinite community would be to visit Soldier’s Delight Serpentine Barrens in Baltimore County, Maryland (near Reisterstown) or Goat Hill Barrens in Pennsylvania on the Maryland-PA border. For those botanical and geological scholars out there, check out Clyde Reed’s excellent, self-published book – Floras of Serpentinite Formations in Eastern North America – available occasionally on ABEBooks.com. From extensive surveys half-a-century and more ago, it includes the Travilah site, as well as all the others, including the serpentinite-esque piney woods in Fairfax County, Virginia near the ghastly 1990s “Taj Majal” complex (itself in reality no worse than any other bloated, over-the-top local development of today, i.e., Tyson’s Corner, Reston-Herndon-Dulles, National Harbor, etc.). Our region’s unchecked overpopulation and overdevelopment make places like Travilah all the more precious. Thank you, Rod, for this further information as well as for leading another great walk.